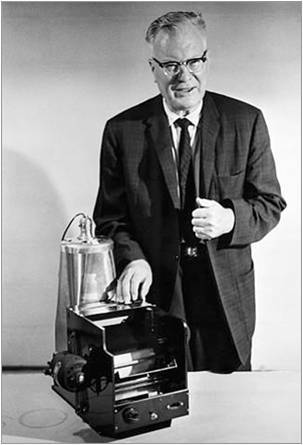 While many scientists attempted to find a way to create print reproductions, it was Chester Carlson (1906-1968), shown above, who first developed a machine for instant copying using electrostatics. In 1968, the Xerox Corporation introduced the first office copier based on Carlson's invention. Carlson named his invention "electron photography," but we know it today as xerography or photocopying. Chester Carlson with an early model of his invention. Bettmann/Corbis. Accessed: 23 July 2010.